“If you see a rainbow over the valley, look out for the waikoloa,” the Hawaiian woman said. “What's the waikoloa?” I asked. “A hard, wet wind that comes suddenly down the valley,” she said, and disappeared in the mango grove. Michael and I had come to see 'Ili'ili'opae, the great Moloka'i heiau, where Hawaiian kahuna practiced rites of human sacrifice only 150 years ago. We hired a car at Ho'olehua Airport and drove to where the island became lush, green, and tropical. We turned makai—as we had been told—down an unmarked red dirt road toward the sea and entered the cool, shady oasis of Mapulehu, a mango grove steeped in perfume so strong it stung our eyes. Under sheltering trees, we stood blinking in half-light as two galloping horses rounded a corner pulling a wagonful of screaming children. They disappeared in fine red dust that settled on the mango trees and all over us. Out of the dust a smiling Hawaiian woman appeared to welcome us with a warm Aloha. I've forgotten her name, but not what she told us—that Mapulehu once was a pu'uhonua, a place of refuge, where in ancient savage days, an errant subject could avoid death by gaining access. The location was appropriate, since 'Ili'ili'opae, the biggest, oldest, most famous heiau on Moloka'i, was a short hike mauka: up the hill. We'd missed the wagon to the heiau, the woman said, but we could go on foot if we liked. She pointed toward the cloud-spiked Mt. Kaunolu, the 4,970-foot island summit, and issued her “waikoloa” warning. We followed the dry stream bed uphill past an abandoned house; it was a steep hike and we arrived at the heiau hot, sweaty, and a little light-headed. No words prepared me for its bulky reality. Nearly three stories high, long as a football field, 'Ili'ili'opae looked more like an early Roman fortification than a Hawaiian temple of doom. It rose in four tiers on the hill overlooking the green mango grove and four fishponds on the south shore of the island. Boulders big as Volkswagens had been fitted together in such tight array that the temple had been held together for centuries not by mortar, but by its own mass. Legend says 'Ili'ili'opae was built in one night by a human chain of ten thousand men who passed rocks by hand up and over the spine of the nearly mile high island from Wailau Valley, ten miles away over a narrow trail. Each received one shrimp ('Opae) in exchange for the rock ('ili'ili). Even under the glaring tropic sun in full light of day, the heiau is a very eerie place. Heat waves shimmer off the flat surface rocks. The walls vibrate with mana strong enough to lean on. I felt like someone was watching me. I knew from reading what happened here long ago, how people were summoned by the beating of drums on the 24th to the 27th day of the moon, how the sacrificial victim was carried into the temple and tied to a scaffold, how victims were always men, not young virgins, and that they were strangled then cremated while priests sat on lauhala mats watching silently. I stepped out onto the heiau, walked right out on the flat table-sized rocks to gain a sense of the whole. I meant no disrespect. I only wanted to get closer—to what? The primal past, the secrets of the heiau. I don't know what compelled my trespass. I knew better and yet I kept walking out farther on the heiau, drawn by something larger than curiosity. Midway across, dizzy under the hot sun, I turned back and slipped ankle deep between a rock that opened and shut around my ankle. Something had hold of me. I yelled for help. The rock moved again and I was free. No spirits, no ghosts; only a misstep on a wobbly rock. 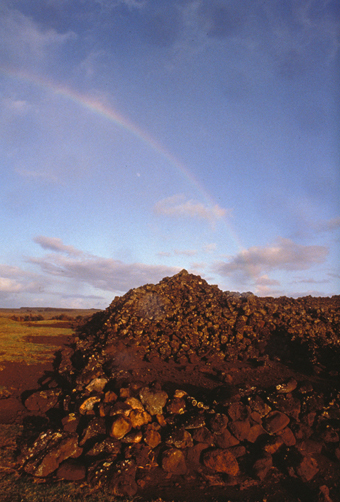 Then I saw a rainbow beginning to glow high on the ridge above the heiau and remembered what the Hawaiian woman said. “It's the waikoloa!” I shouted, as the rainbow grew bigger, brighter. The flash flood sent water coursing down Mapulehu's dry stream bed. Rain pounded the hot rocks of the heiau, sending up clouds of steam as rainwater seeped around old smooth stones and trickled down to the soul of the temple, where relic ashes repose. Michael and I scrambled down the stream bed awash in runoff. Water ran through the rocks and across the highway and into the mango grove and over the beach, staining the fishponds and the sea blood-red. The entire south coast of Moloka'i oozed that redness the next morning when Michael and I flew back to Honolulu. I don't know if one thing had to do with the other. I am sure it was all coincidence. I do know it was good to visit 'Ili'ili'opae heiau, but it was better to leave. ASIDE: A “heiau” is an ancient Hawai’ian temple. ‘Ili‘ili‘opae Heiau is located on the island of Moloka’i, and is, according to the Hawai’i Chamber of Commerce’s website, “the second largest and possibly the oldest religious site in Hawaii.” Built in the 13th century as a school for sorcerers, the huge stone platform (320 x 120 feet) there today “is probably only a small portion of the original structure, which could clearly be seen by canoes approaching from Maui, making it a very formidable site.” The site is on private property, but you can call 800-670-6965 or 808 558-8132 to get permission to visit.